African leaders have agreed to create the continent's largest free-trade zone, covering 26 countries in an area from Cape Town to Cairo. The deal, signed in Egypt, is intended to ease the movement of goods across member countries which represent more than half the continent's GDP. Since the end of colonial rule, governments have been discussing ways to boost intra-African trade. The poor state of roads, railways and airlines have made it difficult. Three existing trade blocs - the Southern African Development Community (Sadc); the East African Community (EAC) and the Common Market for Eastern and Southern Africa (Comesa) - are to be united into a single new zone. With this agreement comes into fruition a century-old dream to link the continent from the Cape to Cairo. Explorers and freedom fighters alike all shared the vision to integrate African economies. And on paper it looks like a progressive step for a continent that has seen average growth rates of 5% in recent years. However, it needs parliamentary endorsements from all member-nations and once governments start reading the fine print, the mood may change. Many of them have small economies that produce few exportable goods. A free-trade protocol would mean they would have to compete with larger industries that could threaten their economies. Africa's many regional blocs have not really aided continental trade so far and the African Development Bank has often said that the focus should rather be on developing infrastructure. Nevertheless if it is implemented in a reasonable time-frame and there is sufficient political will to follow through, then it marks a new beginning for local trade. Will Cape to Cairo free-trade zone work? The pact - known as The Tripartite Free Trade Area (TFTA) - will then be officially unveiled at the upcoming summit of the African Union this weekend in South Africa. BBC Africa Business Report's Lerato Mbele says the idea behind it is to remove trade barriers on most goods, making them cheaper, and stimulating $1tn (£648bn) worth of economic activity across the region of more than 600 million people. However, concluding the deal in Egypt will merely be the first step and it will need to be approved by each country's parliament, before the wheels are set in motion, she says. It is hoped that this will happen by 2017. Analysts say countries within a free-trade zone agree to reduce or do away with certain trade barriers within that area, but still pursue their own trade policies when it comes to outside countries. Kenyan academic Calestous Juma said the move was "extremely exciting" for the continent as, once implemented, trade within Africa would increase to 30% from 12%. 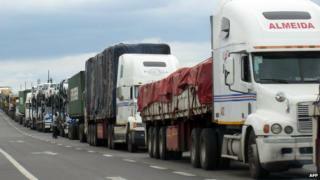 "The comparison with Europe is 70% of their trade is within Europe," he told the BBC's Focus on Africa programme. "By having larger markets, it signals the possibility of being able to manufacture products at a scale that is cost-effective. "For example, where you need large-scale investments like $200m to create a pharmaceutical factory, you couldn't do that if you were only selling the products in one country." He said the consolidation of financing would be another benefit of the TFTA. "As soon as banks notice that they can lend to larger investors, say in manufacturing, that will lead to the liberalisation of the financing sector, greater access to finance and more investors coming to Africa." Botswana Kenya Comoros Burkina Faso Central African Rep.